Mr. Gao Qian may not be a titan of industry, but he represents the delicious aspect of the China International Import Expo (CIIE). He is a manager of baking center at Lesaffre. 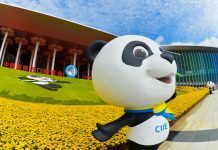 His long experience in Shanghai has given him an understanding of where the city came from, and where it will go after the economic launching pad that is the CIIE. The city and Lesaffre have grown hand-in-hand over the last twelve years.